The measures_interp interpolates MEaSUREs ice surface velocity data at any location(s), along a path, or onto a new grid. speedi = measures_interp('speed',lati_or_xi,loni_or_yi) returns local surface velocity at the location(s) given by lati,loni or xi,yi. Input coordinates are determined as geographic or polar stereographic automatically by the islatlon function. [vxi,vyi] = measures_interp('velocity',lati_or_xi,loni_or_yi) returns the polar stereographic (true latitude 71S) x and y components of velocity. err = measures_interp('error',lati_or_xi,loni_or_yi) returns a scalar value of uncertainty estimates presented with the dataset. count = measures_interp('count',lati_or_xi,loni_or_yi) returns the count of scenes used per pixel. [u,v] = measures_interp('uv',lati_or_xi,loni_or_yi) returns the geographic zonal (positive eastward) and meridional (positive northward) components of velocity. [along,across] = measures_interp('track',lati_or_xi,loni_or_yi) returns velocity components along or across a specified track. This can be used to estimate flow through (the across component) a flux gate or grounding line. For the across-track component, positive values are to the right. [...] = measures_interp(...,'method',interpMethod) specifies any interpolation supported by interp2. Default interpMethod is 'linear'. 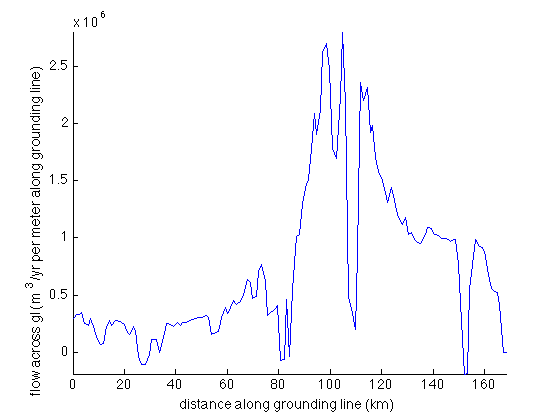 For context, we can plot this grounding line on a lima image with velocity vectors overlaid. If we think of the grounding line as a path along which you might walk, the only component of ice flow that contributes to continental mass loss is the cross-path component. 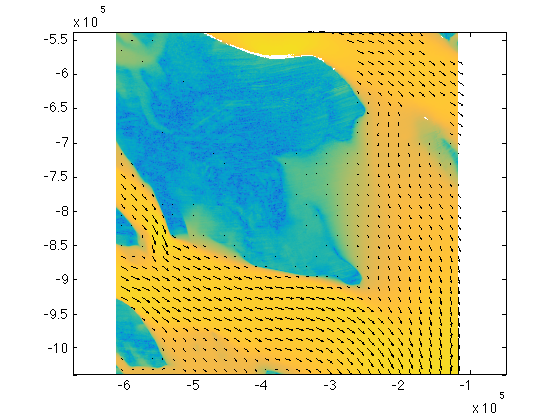 To estimate the volume of ice crossing the grounding line, interpolate the cross-track component of ice velocity along the entire path of the grounding line, then multiply velocity by thickness for each unit length along the grounding line. First we define x as the distance you'd walk along the grounding line and dx is the approximate distance between points along the grounding line. Here we use the pathdistps function to calculate the distance traveled along the grounding line. 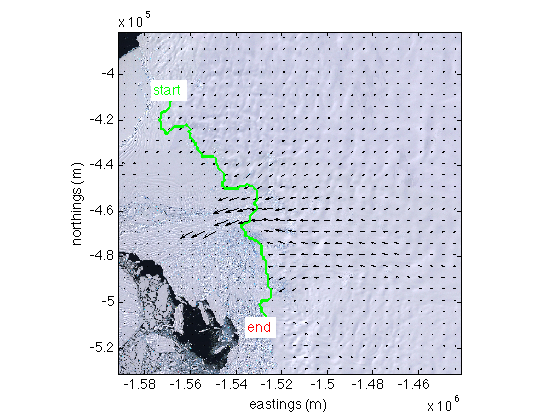 Above, we see that sometimes ice flow is negative--that happens where a sinuous grounding line lets ice go over the ocean, then reground, then cross the grounding line again. We can easily distill all this rich information down to a single value of mass loss if we ignore firn density and say that everything flowing across the grounding line is pure ice. massBalanceGT is taken as the negative to indicate mass loss and multiplied by 1e-12 to convert from kg to GT. This value is in close agreement with 113.5 GT/yr found by Rignot et al., 2013. July 2014: First version written. August 2014: Updated as a plugin for Antarctic Mapping Tools. October 2016: Fully rewritten--Now reads data from the new measures_data function, which reads the .nc file directly. May 2017: Updated for data version 2. This function was written by Chad A. Greene of the University of Texas Institute for Geophysics (UTIG), July 2014. Rewritten October 2016 for efficiency and usability.